On February 1, my program coordinators Cindy Lyles and Danielle Hall read/performed poetry as part of the university's black history opening ceremonies. When poet and professor Adrian Matejka asked me if I knew of potential student participants, I immediately suggested Cindy and Danielle, both of whom are graduate students. I've heard them read their poems before, and I knew that they would represent well. They exceeded my expectations. SIUE, like so many universities, has few public events where collegiate black women can observe fellow black women presenting political ideas. Occasionally a black woman guest speaker is brought in to present for a special program, or the sisters might be fortunate enough to take a class with one of the few black women professors at the university. But overall, it's unlikely that collegiate black women will encounter black women who are only slightly older in positions to present political ideas or concepts related to black consciousness. When it comes to verbal and linguistic expressive forms, the black men on campus control the rap scene; the white students run the page-based poetry; and our most skilled spoken word artists on campus are two sisters--Cindy and Danielle. 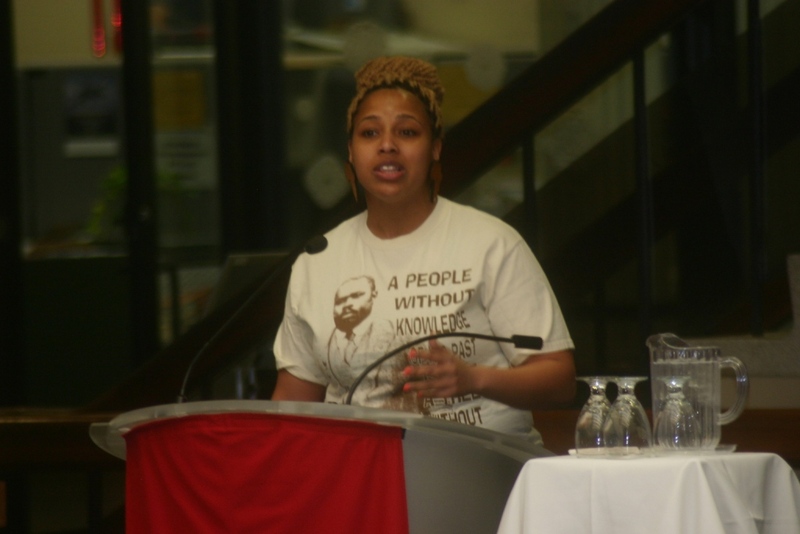 It was a rare moment for such a large audience at SIUE to witness two politically-minded black women dropping knowledge, employing artful verbal skills, and projecting their voices with such force and intensity. Spoken word poetry, I realized, fills an important void when it comes to African American artistic expression on campus. Whereas rap contains appealing, emphatic deliver styles, the form is embedded with a sense of aggression and competitiveness that can be off-putting, if not offensive. Literary or academic poetry offers several possibilities for communicating ideas, emotions, and observations, but when read aloud, page-based poetry often pales in comparison to the high standards set by black performance discourse. (There are exceptions with rap and literary poetry, but those exceptions are, well, exceptions). Spoken word poetry has the power to inspire and educate, especially when poets speaks about a connective experience and not simply at their audiences. Skills spoken word artists can speak assertively and rhythmically without being aggressive, and they can express emotions without sacrificing black performance traditions. 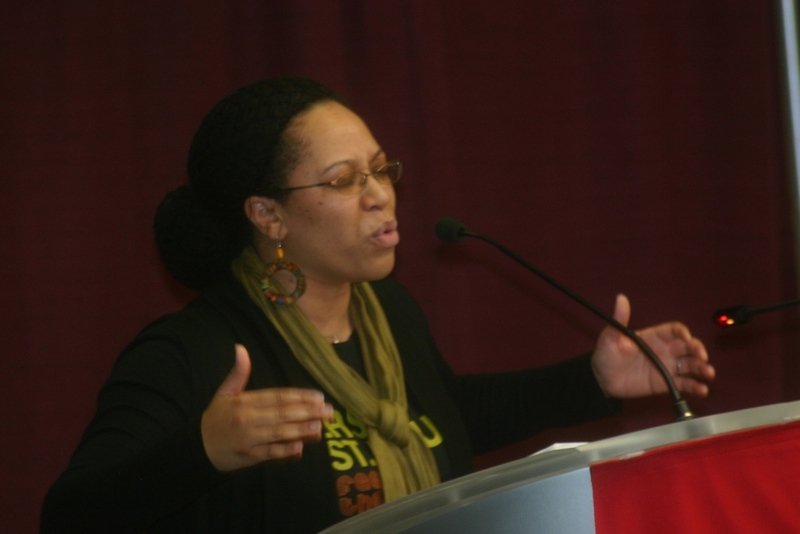 I was especially pleased that so many young sisters had the opportunity to experience the two sister poets. Cindy and Danielle provided the collegiate black women in attendance with a glimpse of the power of spoken word poetry, which included the practice of artfully presenting ideas in public.